Standing room only on March 19 at the event held at Rev: Ithaca Startup Works! Inside: emerging startups, interesting new programs, gender-aware investors & words of wisdom for entrepreneurs! Nearly 200 people registered for the event from across New York and beyond, including investors, entrepreneurs, students and business advisors. Attendees participated in a meaningful dialogue about the challenges women in tech and finance face, and how best to overcome them. 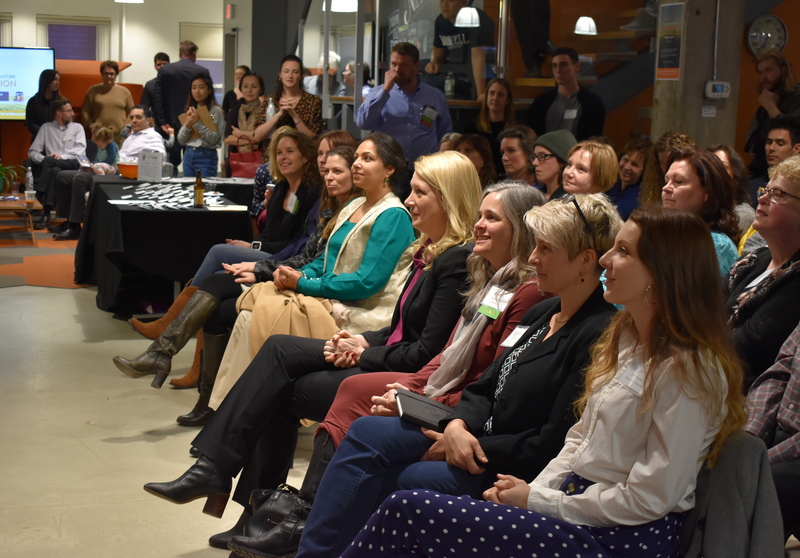 Cultivating relationships between entrepreneurs and capital providers is Upstate Capital’s primary goal, and the program kicked off with lightning pitches from three women-led startups, Heat Inverse, Cally and Shrubbucket. 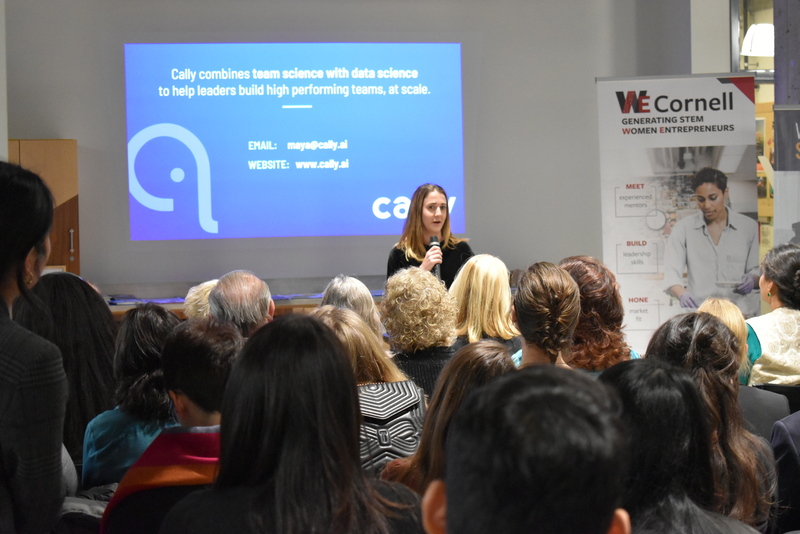 Then, audience members heard from three potential startups coming out of WE Cornell, Cornell University’s new program for women studying STEM and considering entrepreneurship. 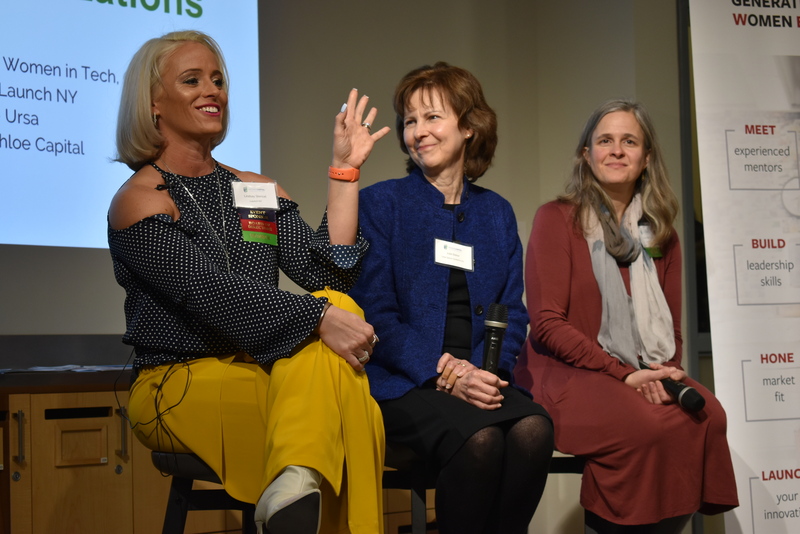 Susan Fleming, a thought leader in gender dynamics in business and finance, introduced “Executive Women in Leadership”, a program she just helped to launch with Deb Streeter at Cornell. This eCornell certificate program is a flexible, online program for women to advance their skills. Starting off her comments with dismal statistics on the rate for women overall and women of color especially, Elisa Miller-Out talked about venture capital investment rates and returns for women-led startups, and shared what she’s doing through Chloe Capital to change that status quo on a national scale. Julie Baker, co-founder at venture-backed Ursa Space Systems, finished the individual presentations with her personal story building about how and when gender parity in the hiring process became part of Ursa’s ethos. She made it clear that it started with CEO Adam Maher’s awareness of gender bias, and it’s evolved to make sure that women are consistently placed in leadership roles throughout the organization. Elisa: "Lead with the numbers! If you have traction with customers, early revenue or have reached some key milestones, be sure to share that early and often with potential investors and partners." Noa Simons, Executive Director for Upstate Capital, closed the program by thanking everyone and inviting them to upcoming events, particularly E^3 & NYBPC - the conference for entrepreneurs, featuring an expo with resources from across New York and beyond for entrepreneurs, and the finals for the statewide intercollegiate business plan competition, where over 100 teams will compete for prize money and recognition on April 26 in Albany. Click here to see all our event pictures. P.S. Through our events, we aim to strengthen connections across our communities. To support that goal, we invite event attendees to write their favorite non-profit organization on their business card, and we draw one card and donate $100 to the organization in honor of the person. Congratulations to Lucia Tyler of Tyler Admissions Consulting and the Ithaca YMCA for winning this month’s drawing!